TWO months ahead of the 2011 Assembly election the DUP and Sinn Féin announced plans for a major project to combat poverty. Their idea was to be called the Social Investment Fund (SIF), which would see £80million ring-fenced for deprived communities. It would require the DUP and Sinn Féin clawing money from existing programmes elsewhere in government to allow the new fund to be created within their shared Office of First Minister and deputy First Minister (OFMdFM). The decision to unveil the initiative in the mouth of an election led critics to brand it a stunt to buy votes, but the two main parties rejected that claim. Today the Social Investment Fund is again mired in controversy because large sums of public money have been awarded to an organisation with individuals connected to loyalist paramilitary group the UDA. But were the seeds of this latest crisis sown by SIF’s troubled past? The new poverty fund was first floated by the two parties in March 2011, followed by a consultation in September 2011. A further 12 months passed before the complex network of SIF ‘steering groups’ was set-up across Northern Ireland to administer the fund. Over the following year the scheme slipped off the radar, despite politicians from the smaller parties asking why the SIF millions had yet to be released. 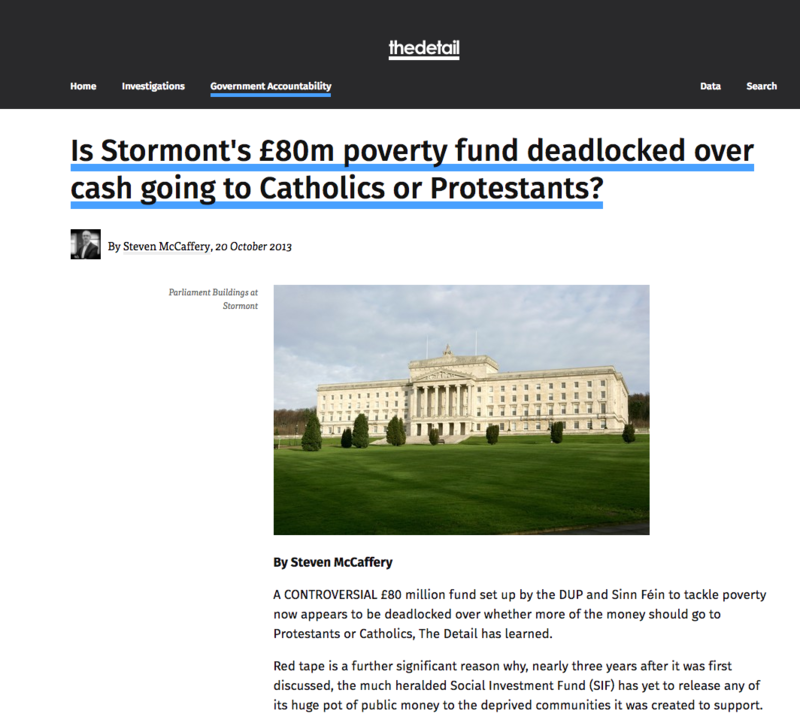 Then, in October 2013, The Detail reported that sources inside SIF were claiming the fund was being held up by red tape, but also by a dispute over whether more of the money would go to Catholic or Protestant communities. SIF promised to combat poverty on “robust evidence of objective need”, but with higher levels of deprivation in Catholic/nationalist neighbourhoods, they could receive more of the money. A member of one of SIF’s steering groups told The Detail at the time that the two main parties were deadlocked on the definition of ‘need’: “That is absolutely what we are hearing. If the money was allocated based on deprivation statistics, then more money would go in to nationalist areas than working-class unionist areas." How would government respond to the allegation? Sinn Féin responded to the claims with a statement that appeared to partially confirm the nature of the stand-off, saying: "Sinn Féin are in ongoing discussions with the DUP in relation to the Social Investment Fund. It is our view that SIF monies should be allocated on the basis of need." When the allegations were first put to the DUP, it declined to comment. If the parties were divided behind the scenes, they tried to avoid a full-scale public dispute, but the lack of clarity fuelled the controversy, as the smaller political parties raised concerns at the Assembly. Within weeks of the allegations becoming public, it’s understood that the DUP and Sinn Féin brokered a deal on releasing the £80million which ended the crisis. 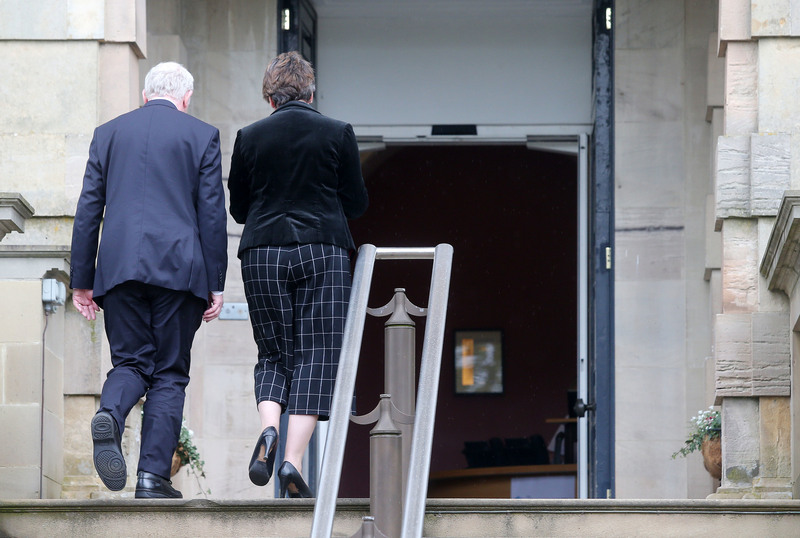 The DUP had initially refused to comment on the allegations that emerged in October 2013, but in November that year the Ulster Unionist Party’s Danny Kinahan put an Assembly question to the then First Minister and DUP leader Peter Robinson. Mr Kinahan asked: "Will the First Minister confirm that the fund has been delayed because of a failure to agree on the split between mainly nationalist and mainly unionist communities?" Mr Robinson replied: "No, I will not confirm that. The processes in our Department are not as vulgar as that." In the weeks that followed, the Social Investment Fund slipped off the radar once again. Three years later, a series of worthy projects have now received SIF funding, but elsewhere there is renewed controversy over some of those who were given funding and how they received it. A system where members of SIF steering groups could oversee some of their own organisations receiving SIF funding was within the rules of the Social Development Fund, but the public might feel that such a process worked against transparency and open competition. On September 30 this year, The Detail asked the Executive Office (the new name for the Office of First Minister and deputy First Minister) for a list of all the groups that benefited from SIF funds and how much they each received. The Executive Office has refused to answer that query. The refusal is confusing, given that a list of SIF recipients was placed in the Assembly Library in response to a question tabled at Stormont by the Alliance Party’s Stewart Dickson last month. You can read that list here. Meanwhile the membership of SIF steering groups is available on the Executive website here. Further information is now required on how much each organisation received from the Social Investment Fund. There are no allegations against any of the groups, who provide valuable public service. The issue is government transparency. The latest crisis over the Social Investment Fund focuses on allegations around individuals linked to the UDA. But is the wider controversy really being driven by the Executive’s failure to deliver transparent decision-making? SEE previous coverage of the Social Investment Fund by The Detail here.